After the enourmous success of their House of Usher (1960) starring Vincent Price, directed by Roger Corman and scripted by Richard Matheson from a tale by Poe, AIP producers Samuel Z. Arkoff and James H. Nicholson looked to cash in on the formula with a follow-up The Pit and the Pedulum (1961) using exactly the same crew. 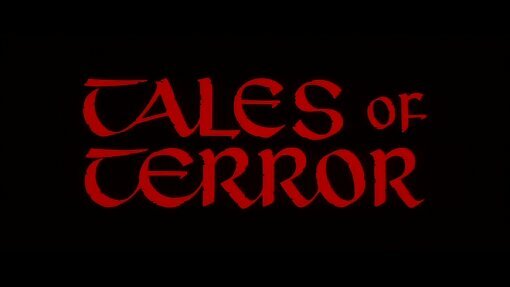 With this film also proving a success they had Matheson adapt three Poe tales for an anthology film. A story of three tales set after, before and at the point of death. In Morella, a young woman arrives at the home of the father (Vincent Price) who abandoned her as a child, looking to spend some time with him for the first time in her life. She discovers that he spurned her because his wife died of exhaustion after her death and the pair reconcile - but the spirit of his wife still inhabits the building and wants revenge. In The Black Cat, Montresor (Peter Lorre) is fed up of his wife's nagging and leaves home again to get drunk - running out of money at the tavern he stumbles into a wine convention and ends up in a contest against the expert Fortunato (Price). Having been thoroughly matched, Fortunato carries home the drunkard and meets his wife, leading to an affair that Montresor seeks to put a stop to. In the final part, Mr Valdemar, the hypnotist Carmichael (Basil Rathbone) is testing his theories on the willing patient Valdemar (Price) who is dying. The latter agrees to be mesmerised at the point of death for Carmichael's experiements. The three stories are connected by a brief linking sequence that is rather unnecessary, making some vague claims about the heart at the moment of death, but does provide some nice dialogue for Vincent Price and allows more time for the stories to develop without the lengthy and contrived linking sequences of the contemporary Amicus anthologies. The first story, Morella is classic housebound AIP Poe, positively dripping in atmosphere with some genuinely creepy moments - it is based loosely on Poe's story although it does lose something in the adaptation and the ending in particular is a little confused. Although entitled Black Cat, the second story takes most of its ideas from a rather strange little short-story of Poe's, The Cask of Amontillado which provides the character's names and the central focus on wine experts. Around these ideas, Matheson spins a light, amusing story which serves as something of a precursor to the more comic direction that the later AIP Horrors would take, particularly Comedy of Terrors (1964). Of the three chapters, this is the only one that seems a little too long and with the film's only real misfire in the form of the lead character's strange hallucinations that add nothing to the storyline. The final part, adapted from The Facts in the Case of M. Valdemar is a very well made and genuniely creepy story that follows Poe's text well - it does change the ending for a rather more dramatic one, but one that is certainly in keeping with Poe's style. Behind the camera, Roger Corman is joined by his regular cameraman Floyd Crosby and the film looks superb, with some very innovate camerawork - particularly the distorted vision during Montresor's drunkenness in Black Cat. The sets are very strong with the desolate house in Morella looking simply superb. As usual Les Baxter provides the soundtrack and does another fine job, really helping to build the atmosphere. If nothing else, this film serves as a Vincent Price show reel as he takes pride of place in all three stories, playing a lonely old man, an effete winetaster and a dying, mesmerised patient - as expected, he excels in all three parts. Peter Lorre is wonderfully cast in the second story and shows a real flair for comedy (making his subsequent casting in The Raven (1963) all but inevitable), while Basil Rathbone conveys a subtle evil as the mesmirist in the final chapter. The anthology format suits Poe's short stories well and the thirty minutes allowed for each story gives them a lot more time to develop than the rather rushed feel of the chapters in the better known Amicus horror anthologies of the late 1960s. Matheson adapts the stories well, keeping Poe's atmosphere if not his original stories. Corman, Crosby and Baxter again ensure the film looks and sounds great and Vincent Price gives a superb trio of leading performances. Recommended to fans of the series. Basil Rathbone - the iconic Sherlock Holmes, playing the character 14 times in the 1930s and 1940s. Directed by anyone	interesting? Roger Corman - AIP's mainstay director in the 1960s, making horror movies such as Pit and the Pendulum (1961) and Man with the X-Ray Eyes (1962) before moving into production, with over 300 movies to his credit. Who is it for? Recommended to all fans of the AIP series and a must-see for Price fans. Print quality is quite good - colours and detail are fine, but there is a lot of speckling. Availability Available on its own or as a double feature along with Twice Told Tales, both now out of print. Available as part of the 7 film Vincent Price Scream Legends Collection. An enjoyable anthology film with some effectively adapted Poe, strong direction and a great trio of leading roles for Price. Not the best looking print, but a perfectly fine way to watch the film. See our reviews of more films starring Vincent Price, directed by Roger Corman or based on Edgar Allan Poe. All text in this review written by Timothy Young - 22nd August 2009.